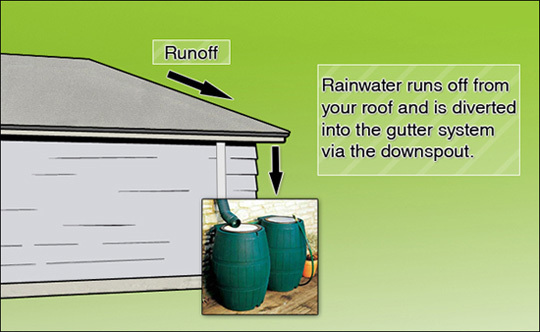 A rainwater harvesting system collects water from a roof which is connected through your gutters to a rain barrel or storage tank. Designs can vary from your simple rain water barrels at the bottom of a downspout for watering your garden to rainwater cisterns. There are things to consider before you start rainwater harvesting.Because the rainwater you plan on harvesting is running off your roof, there are safety concerns. Some roofing materials will contaminate rainwater and make it dangerous to use. You should not use roof catchment areas that incorporate asbestos shingles, tar and gravel, or treated cedar shakes. You should also check your gutters to make sure that they don't use lead solder or lead based paints. Once you know that you can harvest rainwater safely, you need to evaluate how much water you want to capture. You can easily do a square foot calculation of the area of your roof to have a pretty good idea of how much water you will be able get from your roof. A large above ground system will take up quite a bit of space in your flowerbed and can get expensive. So it's important to understand what you want and have a budget in mind before you go shopping. You should ask yourself if you plan on watering your lawn, washing your car or maintaining your vegetable garden with your rainwater reserves. You may want to have one barrel or a rain chain of barrels,so it's all these things that you have to think about.It's important to do an assessement of how you want to plan your installation. Activities like watering the lawn can consume lots of water, so do your homework. Check your water bills from the last few summers to determine how much water you use during the peak summer months and plan from there. To keep the foundation of your home safe from water damage, it's important that your rain barrel have an automatic overflow mechanism that diverts water back into the downspout once the barrel has been filled or to an overflow hose that drains downhill away from your home. When watering your veggies with rainwater, keep the water flow at ground level, away from the stuff you'll actually be eating, and don't use rainwater within a couple of days of harvesting your crop. After raintwater harvesting, always wash your vegetables thoroughly with tap water. There are some good habits you should adopt when rainwater harvesting. Keep the top of your rainbarrel firmly in place. Exposing rainwater to sunlight and open air will encourage algae growth. Make sure the mesh screen on top of your rainbarrel is secure to keep out water-loving bugs, like mosquito hawks, frogs, lizards, and any other little critter out of the water. Clean the filter regularly according to the manufacturer's directions, and inspect your rain barrel every once in a while for leaks. Keep your rain gutters clean, and make sure that water is flowing freely to and through the downspout when it rains. Keep your gutters free from leaves and other debris.